A few weeks ago, I read a string of hero-as-chef romances all in a row: The Chocolate Thief by Laura Florand, Ruby by Jeffe Kennedy and this one, Truly by Ruthie Knox. I waited to review it until closer to the release date, which is this Tuesday. I’d read one other book by Knox in the past and fully expected to enjoy this one. I’m happy to report that it didn’t disappoint. May Fredericks is an essentially bright and sunny Midwestern Amazon. She has been dating a professional football player for several years and has just moved from Wisconsin to New York City to be with him. He chooses a special moment to ask her to be his wife. However, what should have been a big, romantic marriage proposal was more like Darcy’s first proposal to Elizabeth in Pride & Prejudice. I won’t reveal what happens, but May decides it’s time to take her life in a new direction, setting off on her own into the wilds of New York City and getting mugged in the process. Her experiences of New York thus far have not been exactly positive. Ben Hausman is a divorced, washed-out chef with an anger management problem. He loves to cook, but the high pressure atmosphere of world-class kitchens has him constantly tense, livid and burned out. He’s killing time with darts, painful literature and gardening for his friends’ farm-to-table restaurant until, as he conceives it, he can deconstruct and then reconstruct his personality into something better and more worthy of good things. One thing he does love though is New York. He keeps beehives all over the city and makes borough-specific honey and honey-flavored products for the local farmer’s market. And before she leaves New York for good, Ben wants May to have some good memories of the city to take back to Wisconsin with her. From the very beginning of the story, May is quite clearly a good thing. She’s relentlessly positive, even in the face of the implosion of her “perfect” relationship and getting her purse stolen with her cell phone, credit cards and ID in it. Her insecurities are deep-seated, but it doesn’t take Ben long to work his way past them. And the third-person perspective at least lets the reader know that Ben is trying to be a good guy, even when he sometimes fails spectacularly. The secondary characters in Truly are also well-drawn, including May’s sister Allie, whose wedding May eventually rushes back to attend in Wisconsin with Ben in tow. The set-up for Truly is a little bit far-fetched, what with May going off to the apartment of a complete stranger within a few minutes of meeting him, but Knox does her best to make it seem reasonable. I had to keep reminding myself that I did some pretty inadvisable things in my 20s too. But once you get past that and into the meat of the story, the transformation of both of these characters into more confident, better adjusted, worthier versions of themselves makes for a very satisfying happy ending. And the way it comes about, through honest communication and learning to trust, was exactly what contemporary romance should deliver. I received Truly via NetGalley, but I would have happily purchased it and I will continue to avidly look forward to future titles by Ruthie Knox. A definite must-buy! Have I mentioned that I love books featuring chefs? They make for very creative recipe options. 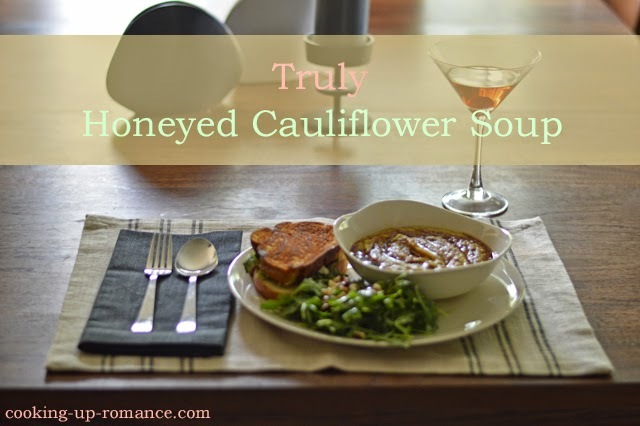 I never would have considered making honey and cauliflower soup on my own, but when Ben sold honey-flavored soups at the farmer’s market, I knew I had to try it. And it turned out that I was not the first to think of it because I found this recipe online when I went looking. I know you’re skeptical. Don’t be. The roasted cauliflower with the curry and the buckwheat honey drizzled on top just sing. However, the soup on its own would be a lot to take as a main dish. 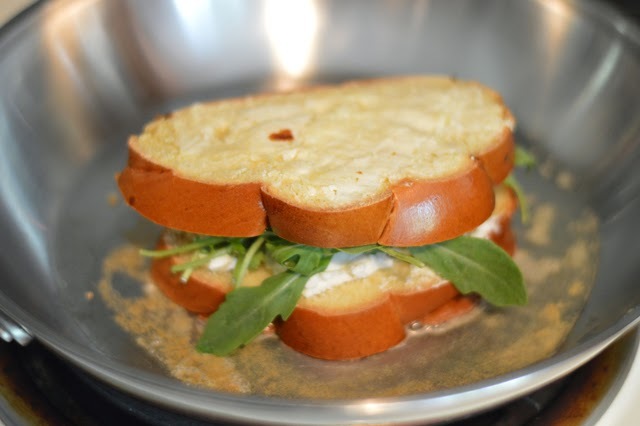 So I paired it with a simple arugula and hazelnut salad with honey-champagne vinaigrette and this easy grilled goat cheese, arugula and clover honey sandwich. I even tasted a few different honey varieties to figure out what would work best in each component to create this honey-themed tasting menu. You don’t have to use a bunch of different honey varieties like I did, but it sure was fun. As for tips, cooking the cauliflower longer than 16 minutes resulted in charred cauliflower so keep a close eye on your veggies. I’m also not a big salt person, but I found that this particular soup had me adding quite a bit more than I usually do so definitely taste it once it’s been puréed to get the seasoning right. Also, I’d been eying immersion blenders for a while and when the first stab at this soup turned out a bit lumpy and unevenly puréed, I decided to go ahead and take the plunge. I’m so glad I did! The immersion blender is just the right tool for this job, puréeing the roasted cauliflower thoroughly and evenly. My regular blender didn’t do a bad job, but the immersion blender was better. 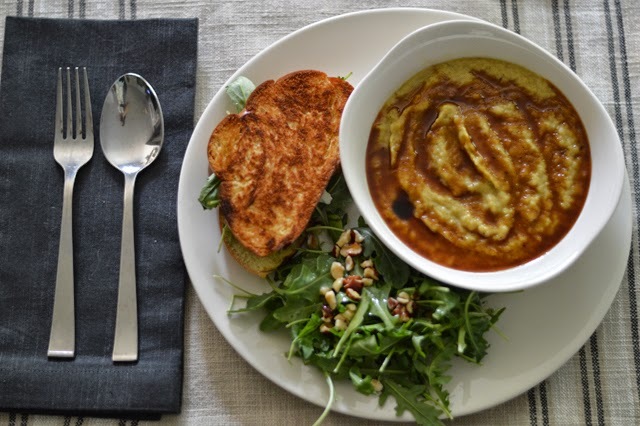 As for the sandwich, I’ve had it twice since running out of soup so even if cauliflower isn’t your thing, you might try this non-traditional grilled cheese sandwich. The sweet honey with the bitter, nutty arugula and tangy goat cheese on the fluffy, eggy Challah is pretty much currently my very favorite thing. I’ll probably have it again for lunch today. And don’t forget the salad! It’s not strictly necessary, but it keeps you from having to eat an entirely brown dinner. 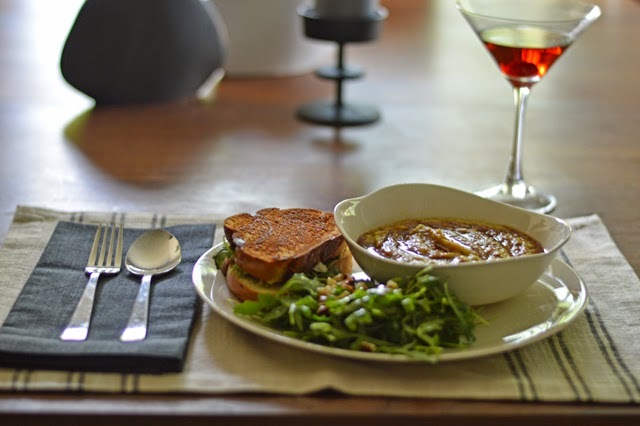 A soup and sandwich combo featuring honey. Preheat oven to 450°F. 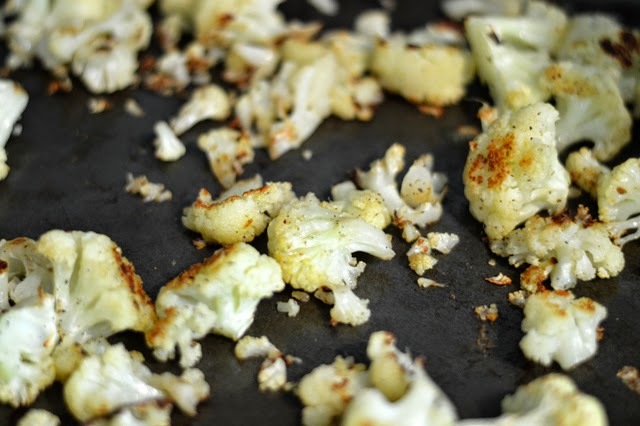 Spread cauliflower florets on a baking sheet, drizzle with 1 tablespoon oil and sprinkle with salt and pepper. Toss to coat. Roast until florets are browned, about 16 minutes, flipping once halfway through. In a small stockpot, heat 1/2 tablespoon of oil over medium heat. Add onions and sauté until soft and slightly browned. Stir in curry powder and cayenne (if using) and cook until fragrant, 1 to 2 minutes. 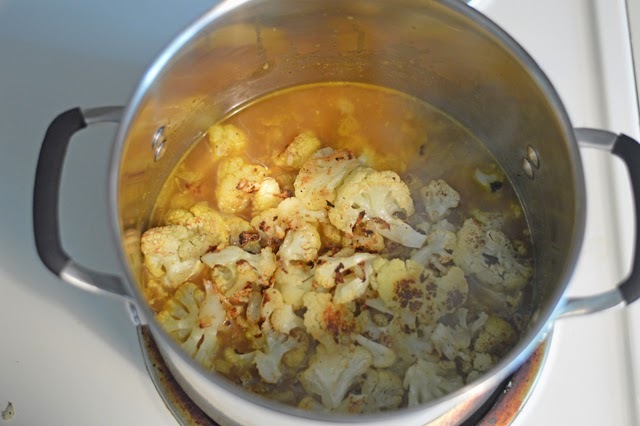 Add chicken stock, water, and cauliflower. Cover and bring to boil and then simmer 5 minutes. Purée the soup with a regular or immersion blender until smooth. Return to pot if using a regular blender and reheat if necessary. Add salt and pepper to taste. 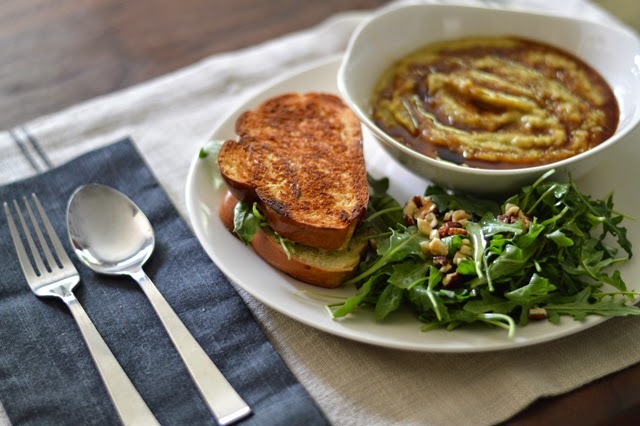 Serve in bowls with a drizzle of honey and sandwiches, recipe below. Heat skillet over medium heat. Butter one side of each piece of Challah bread. Evenly divide remaining ingredients between two pieces of bread and top with remaining slices. Place in skillet and cook until cheese is warmed and bread is golden, about 3 minutes each side. Disclosure: I received a complimentary copy of Truly via NetGalley for review purposes. What a perfectly delightful looking lunch! And I enjoyed the book review too. I definitely did some unadvisable things in my younger days and I'm sure an attractive man like Ben would have had my attention, surly attitude notwithstanding. I hope Allie's story is next.